The Family Tour is one and 1/2 hours of fun exploring the sheltered waters of the Dolphin Sanctuary...just 30 minutes from the Adelaide CBD. Here you find one of Adelaide's "secret spots", an area of incredible beauty. 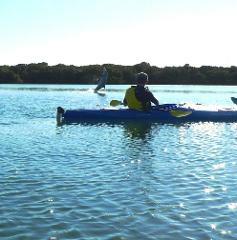 The sheltered mangrove creeks are home to a fascinating array of marine life, birds and the Port River Dolphins. All this makes for a sensational adventure and kayaking is the most environmentally sensitive way to explore and interact with the dolphins. The tour is very easy paced with plenty of time for photos and story telling by your guide and searching for the Port River Dolphins. This tour is aimed at families with younger children aged 4 to 8 years or grandparents. When the Port River Dolphins come to play it is a memory you will treasure for ever! This tour is conducted in stable, very comfortable two and three person kayaks which are suitable for all ages and levels of experience. The whole family can travel in the one kayak! If you have been thinking of getting the family into kayaking this is the best way to give it a try...you will want to come back for more! 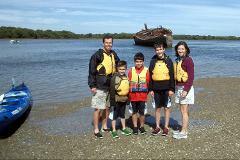 This is also a great experience for older adventurers who love coastal environments and dolphins! 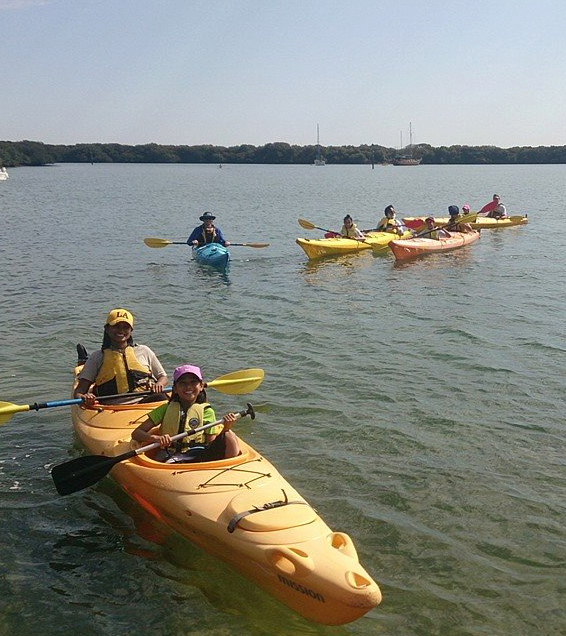 Kayaking is a great activity for all family members and ages...it is an activity that the kids and adults will enjoy equally and the experience is one all will want to talk about. If you are visiting South Australia paddling with the dolphins has been voted one of the top 10 MUST DO activities in Adelaide! Bookings are essential and can be made right now using our online booking system, you can also book with a credit card over the phone or send an email to: bookings@adventurekayak.com.au If you have left it to the last minute you might be able to book on the day via phone. Call 0429019141. If the date you want is sold out you can go on a waiting list by completing all booking details, your credit card won't be charged and we will get in touch if places become available. We only advertise this tour on Friday, Saturday or Sunday during our "peak" season but it can be offered on any day of operation subject to availability. Give us a call to discuss the day you would like to go exploring. Full details will be sent via email immediately once your booking is made. If you do not receive this please contact us straight away. Please review the details taking note of the starting time, location and transfer (if requested). Please check the terms and conditions also included. We will contact you by email the day prior to your tour if any of the details change due to weather or other conditions. Please contact us if you will not be checking your email or have any concerns about these details. To the many international visitors we have please contact us 24 hours prior to your booking or when you arrive in Adelaide as we often have great difficulty with international numbers provided and may not be able to contact you with any changes. Garden Island Boat Ramp and Reserve, Lot 204 Garden Island Road, Gillman. This is a public reserve; We are a mobile business and have no office at this location. 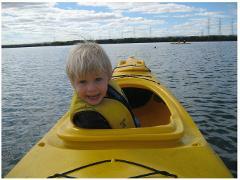 Look for the Adventure Kayaking vehicles, lots of kayaks/SUP's and happy people! The Port Adelaide Visitor Centre, 66 Commercial Road, Port Adelaide will also supply a map if you call in on the way to kayaking; you can also check out what else is happening in The Port and make a day of it! Most people drive out to Garden Island. Unfortunately public transport doesn't travel to Garden Island. There are regular train and bus services to Port Adelaide and we can provide a transfer out to the kayaking and return for $10 per person...much cheaper than a taxi or UBER! We meet you at the Port Adelaide Visitor Centre, 66 Commercial Road, Port Adelaide (green flag bottom left of map) 15 minutes prior to the start of your tour. This location is about 10 minutes walk from the Port Adelaide train station; the bus stops very close to the Visitor Centre. This is a limited service, please be on time, some delay may occur after your tour before transfer back to Pt Adelaide. Train & Bus timetable can be accessed at : www.adelaidemetro.com.au or download the Moovit app on iPhone or android. Please indicate you need this service when booking. A CAMERA! We can supply a waterproof container . Transfer from the Port Adelaide Visitor Centre to Garden Island...the only way to come kayaking if you are relying on public transport! A spray deck- a device to keep you much warmer and drier for cool days.